Had a hard time getting all the produce you wanted at a decent price this winter? Fortunately, spring fruits and veggies are on their way in, so you can get all the nutrients you need without going over budget. For some added fun, try incorporating some of these delicious seasonal items into your everyday cooking routine. Asparagus can be quite the pricey item when it’s out of season, but it hits its peak March to June, so now is your chance! Asparagus is low in calories and sodium and high in vitamin A and vitamin K. It’s flavourful and has a wonderful crunchy yet soft texture. Asparagus is known to have tough ends which can be stringy and less enjoyable to eat. To make the most of this veggie, hold a piece of asparagus by each end and bend until it snaps. The half with the head can be chopped into one-inch pieces for the dish you making. If you really don’t like the tougher texture you can discard the other end, but a more economical route is to toss the really rough sections and chop the rest into thinner pieces so that they have a better chance of tenderizing. 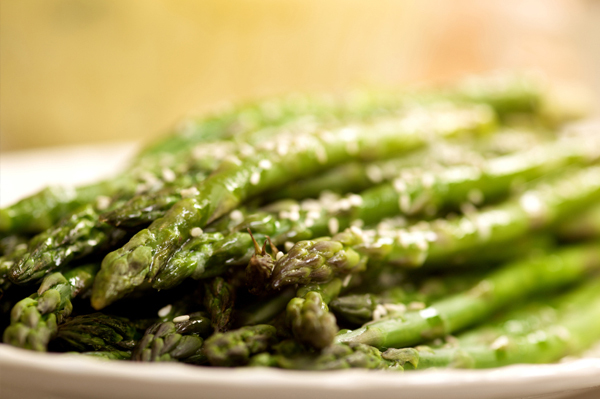 Asparagus is great as a simple side, or cooked into stir-frys or pastas. Or, for a healthy spring meal, accent a creamy Dijon chicken with some lovely fresh asparagus. This superb source of vitamin C started its season in winter and lasts all the way until spring. So now is a great time to start your mornings off with a delicious hunk of this tangy fruit. Simply cut one down the middle, sprinkle with a touch of Splenda or a teaspoon of maple syrup and scoop away! Radishes are at their best through the entire spring season and into early fall. They’re crunchy like a carrot but also carry with them a unique spice. And they add a great pop of colour to salads and other vegetable concoctions. There are several delicious types of radishes to choose from and exquisite recipes for each of them, so you will find yourself incorporating this gorgeous root vegetable with ease. Though artichokes are also harvested in the fall, the spring is when they are really at their best. They are a good source of vitamin C and folate, so seize any opportunity to incorporate them into your cooking routine. Many people avoid artichokes because of how complicated they appear. But don’t give up so easily! Once you understand how to disect the little green globes you’ll be eager to incorporate them into casseroles, dips and sauces. Rhubarb can be very hard to track down when it isn’t in season, so seize the opportunity to stock up this spring. Even if you don’t manage to use it all, you can chop up the leftovers, seal them in a Ziploc and keep them in the freezer until you’re ready to whip them into a delicious tart or chutney. Rhubarb is unique in that it works perfectly in both sweet and savoury dishes. A good old favourite that you can’t go wrong with is strawberry rhubarb pie. But it also goes well with meats so don’t hesitate to try something along the lines of Canadian Living’s lamb and rhubarb stew. You won’t be able to get your hands on these delicious spring items at their in-season prices forever so celebrate the season and make use of them in your meals today!